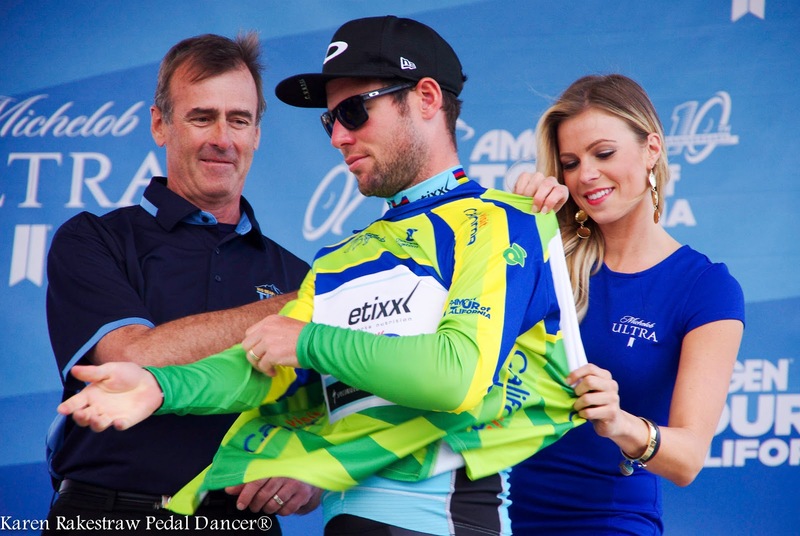 Classification Jerseys for the Amgen Tour of California 2016 are awarded for best type of rider in a field. This year the Tour of California will feature 5 classifications: Leader (fastest overall time, yellow/gold jersey, also called GC); Mountain (climber, red polka dot jersey); Sprint (fastest sprinter, green jersey); Best Young Rider (under age 25, white jersey); Most Courageous (most combative/competitive, blue Breakaway from Cancer jersey). Look for these jerseys on the road or on the TV: yellow, green, polka-dot, white and blue. 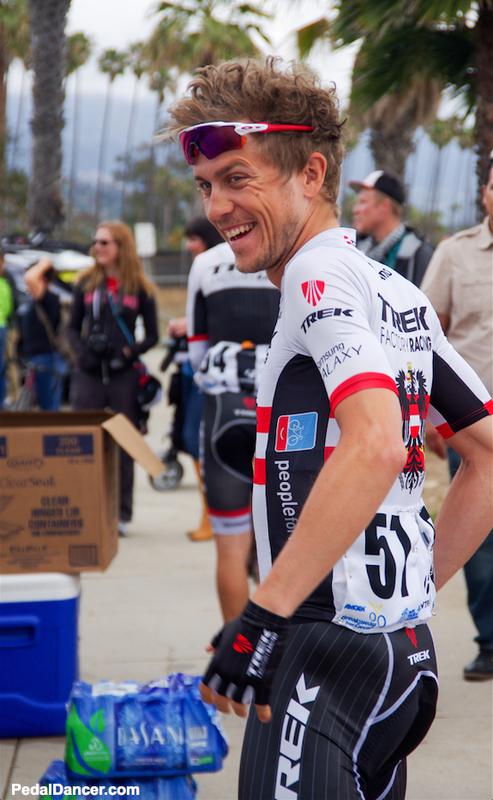 The competition for the classification jerseys begins on day one: Stage 1 in San Diego. As the stage race progresses the overall classification winner is presented with his jersey on the podium after each stage and will wear the jersey at the start of the next day's stage. Peter Sagan won the Tour of California last year and will be returning to the ATOC again in 2016. Peter Sagan is also the current World Champion and wears the rainbow striped jersey in every road race.Peter is also the current Slovakian National Road Champion and Time Trial Champion (he's had a good year!). At the start of Stage 1, Peter will be wearing his rainbow jersey at the start line. 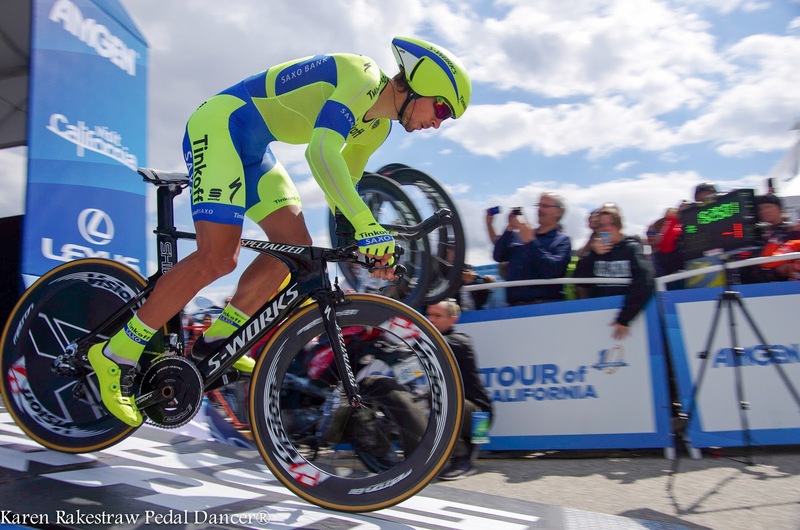 What if Peter Sagan wins Stage 1 in San Diego,will Peter wear the Amgen yellow leaders jersey or will he wear his rainbow jersey? 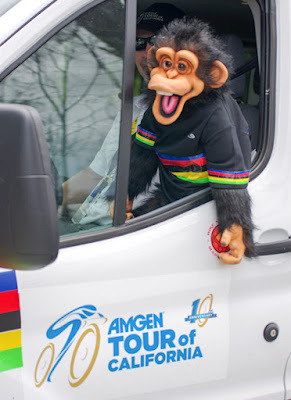 UCI rules state that the race leaders jersey trumps the rainbow jersey,so at the Tour of California and other UCI pro races, Peter would wear the yellow leader's jersey on the road, or the green sprinters jersey, if he earns either of those jerseys after any stage of the race. Otherwise we will see Peter Sagan in his white and rainbow striped jersey (which is equally thrilling). However, when Peter steps onto the start ramp at the Folsom time trial, don't be surprised if you see him in his Slovakian National time trial skinsuit. Unless he is in the lead in a classification and he will wear the leader's yellow or the sprinter's green jersey, made into a special skinsuit just for him. This is the order of priority of jerseys. On the podium, the stage winners are awarded before the classification winners. Sometimes the jerseys are awarded out of order on the podium if a rider is late in arriving, but the yellow jersey is always awarded last. What if Peter is ahead in both the overall(yellow) classification and the sprinter (green) classification - which jersey will he wear? According to UCI rules there is a specific order of priority of jerseys. 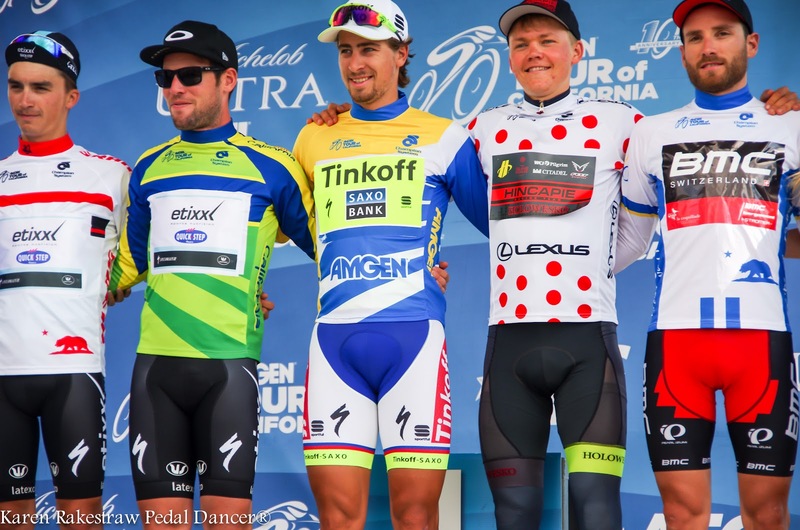 The classification jerseys take precedence in order of yellow, green, polka-dot, white. If a rider is already in a more prominent jersey and has earned one or more other jerseys, he will be awarded with all his jerseys on the podium, but will wear the more prominent jersey at the start of the next stage. His other jersey would go to the second-place rider in that specific jersey classification, who would wear the jersey the next day during the race. Because a rider can only wear one jersey at a time, and because every race organizer wants to have all five jerseys be seen during each stage of the race. So don't be confused if you read that one rider won a classification but another rider shows up wearing his jersey at the stage start on the next morning. In summary the World Champion jersey trumps any National Champion jersey, but the World Championship jersey is trumped by the race classification jerseys. Peter Sagan is serious about defending his overall race leaders jersey again this year. I am looking for Peter to be wearing yellow ... or green ... or rainbow, he looks great in them all. What if the first stage is a sprint? As the stage progresses the first riders over the KOM marker (mountain points) will be tallied to award the first polka-dot jersey. The youngest riders (under age 25) will be tracked to award the white jersey. There are two sprint markers on route of Stage 1 but the finish line is also considered. Look for the rider vying for the green jersey to sprint at the markers in Navajo Road and Imperial Beach to attempt to weed out the field for the green jersey. It is possible that the first and second place finishers on Stage 1 will wear the yellow (1st place) and green (2nd place), it depends on the motivation and plans of each sprinter. WHO DECIDES ON THE MOST COURAGEOUS RIDER? This is a subjective award decided on by a panel of "experts" (read important people) gathered to acknowledge effort and courage displayed during the day's stage. This is not an accumulated classification but a spotlight on an different individual every stage and the awarding sponsor of the most courageous/aggressive/combative lime-light hogging jersey. HOW IS THE BEST TEAM DECIDED? The best team of the tour is determined by the lowest accumulated time. They get to celebrate wildly with champagne on the final podium. The accumulated team time is calculated based on the total time of the first three riders across the line from each team, each day (not the highest 3 on GC). This accounts for the entire team effort on climbs, sprints and time trials to be considered. Each day those three rider times are added to the next day's three riders with the lowest times, the times accumulate for all 8 stages, and the lowest team time wins the title. 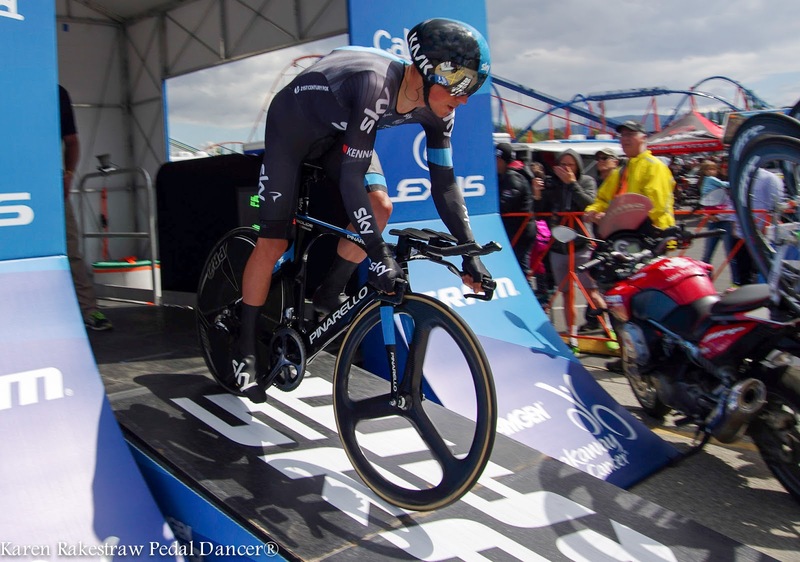 Team SKY won best team at the 2015 Amgen Tour of California. Because World Championships are awarded in road racing, individual time trial and team time trial, each jersey must, and can only, be worn during the specific cycling discipline. The current winner of the World Champion Time Trial, Vasil Kiryienka (Belarus) racing on Team SKY, must wear the time trial skinsuit during every ITT and TTT competition for a year following his win. Peter Sagan, the current Road Champion, cannot wear the rainbow striped jersey during any time trial stage. All riders who have earned a National Championship Time Trial may wear their national colors skinsuit during the time trial. The current Team World Time Trial Champions, BMC Racing Team, wear a small UCI rainbow emblem on the front of their jerseys year round, during both road and ITT or TTT stages. Time trial stages do not typically award KOM points. The polka-dot jerseys earned by a rider after Stage 5, in this year's Tour of California, will be worn at the start of Stage 7 in Santa Rosa. Yes, all classification jerseys are worn during the time trial (with special skinsuits often made for the riders. We call them race numbers here in the United States. Bike racers know them as bib numbers, European bike racers as dossard. They are the numbers identifying a racer worn on his or her jersey and on their bike. There is a meaning to the bib numbers (dossards) worn by each rider on a team: read more about the bib number at Word of the Day: Dossard , By Pedal Dancer. WHO WILL WEAR BIB #1 IN 2016? It is tradition that the previous year's overall stage winner, if returning to the race in the current year, wear the #1 on his jersey. His team being recognized as the first team, thus his teammates wear #2-8. The other teams are ordered according to race organizers preference; eighteen teams total with eight riders each. At the Tour of California, as is usual, you will see the WorldTour teams listed before the Pro Continental or Continental teams wearing lower bib numbers. The 2016 startlist should be announced (hopefully) within 2-48 hours. Anticipation! More Fan Education provided by Pedal Dancer®.